Posted December 13, 2016 by Antony Taylor & filed under Nutrition, Weight Loss. This is such a common weight loss mistake people are making. Having a sneaky chip or 2 from your kids plate? Pinching a few crisps from your friends lunch? Or perhaps eating one half of a custard cream and not recording it? Yeah, those calories add up AND they matter more than you’d like to think or admit. Stop kidding yourself with how much you are consuming, stop the mindless eating. If you’re bored, do something interesting. Paint a picture, go for a walk, read about something you’re interested in or start learning a new skill. Eating because you’re bored is just lazy. 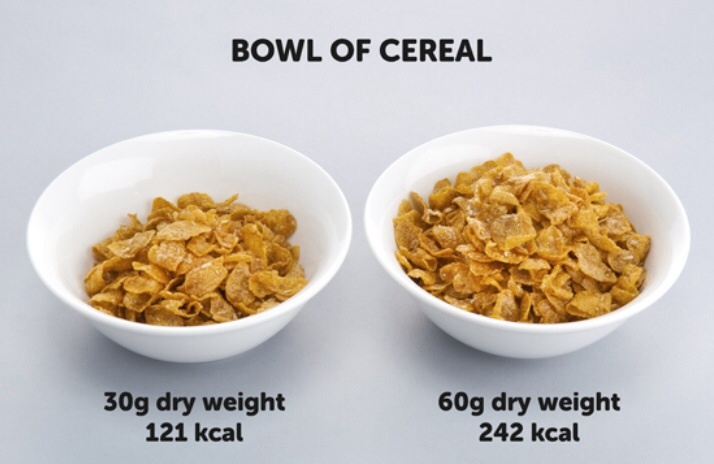 You’re underestimating your portion sizing…. Cereal fan? Like a bit of peanut butter on your toast in the morning? That “healthy recipe” you make for the whole family, are you having a higher percentage of that than you should be allowing yourself? There’s nothing wrong with cereal, or peanut butter or even butter, but these are all foods that are very very easily over consumed. Your solution is to weigh them out every time if you think that you regularly take liberties with the amounts you eat, vs the amount you claim to eat and honestly, it’s easily done when trying to measure by eye, so don’t try to. Drinking… This ones 2 fold. These come in all shapes and sizes, some won’t have many calories BUT can add up quickly. Even a 250ml glass of the no added sugar versions can be 7-10kcal. Now I know that’s not very many, but if you have 10 glasses of squash a day that’s 70-100kcal that can be 490-700kcal a week. That’s potentially a couple of gym sessions for many people. Now If you consume those calories regularly and don’t allow for them, they will DEFINITELY stall your progress, no doubt about it. This might seem really obvious to some but many people simply “forget” to include this into their allowance. Some alcoholic drinks can be HUUUUUGE in calorie values, some mixes and especially cocktails can be extremely high in sugar too. Remember ALL CALORIES count and that DEFINITELY includes ALCOHOL. If drinking is unavoidable to you every now and again, take the calories from your carbohydrate allowance. So eat your protein, eat your fats and hold some carbs back for the beers. Sometimes I find that people are great at eating well Monday to Thursday, and then simply don’t give a damn at the weekend. You’ve been good all week right? Meat and rabbit food all week and you’ve earned a weekend of burgers and haribo. Most of the time you will simply maintain weight with this method at best, at worst you’ll actually gain weight. This is simply because eating lots of calories doesn’t take very much or very long at all in this day and age. Calories are very easy to come by. You need less calories than you think you do…. If you are following your calories CONSISTENTLY and training regularly. You aren’t making mistakes like the ones above. Simply, you are not as active as you think you are and you likely need to eat less food because you don’t need the energy. Take 50-100kcal away per day and see what happens. What do all of these mistakes have in common? Consistently making them means you will not be in a calorie deficit, and so no fat loss. It really is that simple. That is it. Go forth and mess up no longer!